If you or someone you know is bitten by a cat, you should always be concerned. 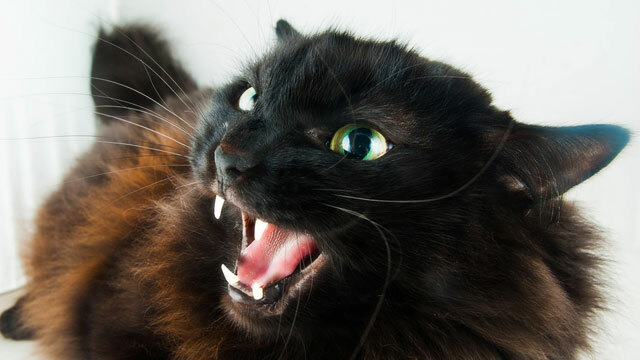 Cat bites lead to infections in humans and other animals that are difficult to treat much more often than do dog bites. In fact, a recent Mayo Clinic study showed that one out of every three cat bites that occur on a person's hand leads to hospitalization. Of those people, around 2/3 require surgery on the injured hand. Cats have sharper teeth than dogs, and they often puncture more deeply when they bite, but the hole in the skin is small and heals over quickly. This allows bacteria from the cat's mouth to be deposited deep into the tissue and quickly sealed in. When a bite is on the hand, the chances are good that bacteria is deposited near a joint or tendon sheath, and these areas are enclosed spots that are quite prone to bacterial growth. Antibiotics usually can't get into joints or tendon sheaths to kill the bacteria, so surgery is usually required. The area must be opened up and flushed out. Any damage that the infection has already done to those sensitive structures must then be repaired. When a bite is not on the hand, it can still be dangerous. Certain types of bacteria that are common in cats' mouths, including Pasteurella multocida, can quickly spread to surrounding tissue and even get into the blood stream, resulting in cellulitis and septicemia, which is extremely dangerous. Children, seniors, those who are immune compromised, and people who are sick are at even greater risk of developing serious problems from cat bites. Not only that, but sometimes the tip of a cat's tooth, especially if the kitty is young, may be left inside the wound, as well. X-rays are often done to ensure that hasn't happened. If you are bitten by a cat, wash the area right away with warm water and soap. Avoid scrubbing vigorously or using chemicals on the area, which may irritate the tissue. Visit your doctor right away to determine if further treatment is warranted. Your doctor will also need to determine whether rabies prophylaxis is necessary. Rabies is transferred through saliva, and it is almost 100% fatal when it isn't treated immediately.